LOS ANGELES--(BUSINESS WIRE)-- Tutor Perini Corporation (NYSE: TPC), a leading civil, building and specialty construction company, today announced that its subsidiary, Tutor Perini Building Corp. (TPBC), has expanded its service footprint to address demand for various types of building projects in the South Central United States. For its first major award in this region, TPBC has been selected by the Choctaw Nation of Oklahoma as the design-builder for the Choctaw Casino and Resort Expansion Project in Durant, Oklahoma. The contract value was not disclosed. The project will be completed under a design-build delivery system. JCJ Architecture and Friedmutter Group are the design partners. 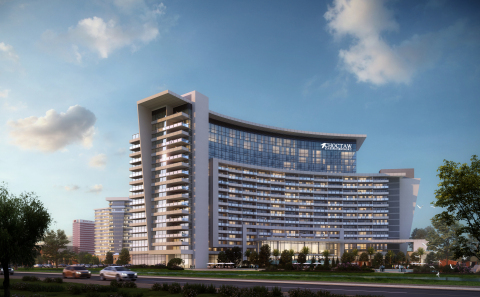 The project scope of work consists of the design and construction of a new 1,000-room hotel that will include multiple restaurants, an ultra-lounge bar, movie theaters, conference facilities, casino expansion, new retail space, resort style pools and a new parking garage. Design work is expected to begin in the fourth quarter of 2018 with substantial completion anticipated in the spring of 2021. The contract value is expected to be included in the Company’s fourth quarter 2018 backlog. Tutor Perini Corporation is a leading civil, building and specialty construction company offering diversified general contracting and design-build services to private clients and public agencies throughout the world. We have provided construction services since 1894 and have established a strong reputation within our markets by executing large, complex projects on time and within budget while adhering to strict quality control measures.